This week, Your Cre8tivity welcomes Davey & Bianca Morrison Dillard to the studio! 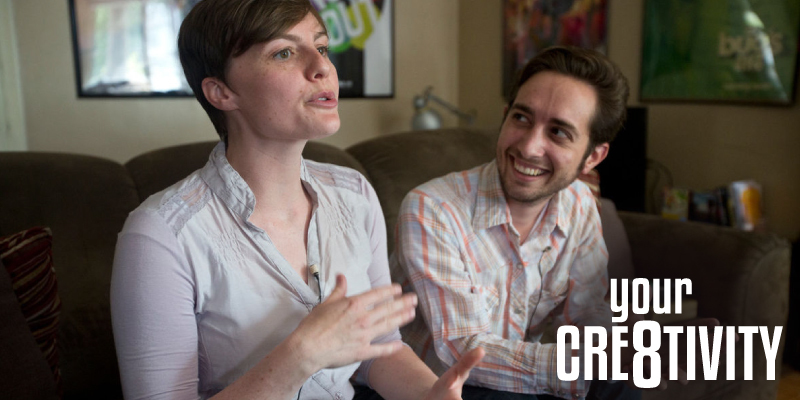 We discuss relationships, on-set woes, production value and their web series Adam & Eve! We also welcome Andrea Peterson back (Guest, Episode 2) to the show but as a host! Join the party! I am an actor, writer, producer and director. Bianca is an actor, producer, director and dramaturg. We are a husband and wife team who frequently work together. Acting and filmmaking are our full-time jobs, and we love what we do. Bianca studied theater at BYU and I studied film. I acted all through high school and college, and we both worked on theater and film projects. We’ve always had a do-it-yourself mentality when it comes to our own projects, and we’ve tried to make those a priority, even if it means occasionally having to say no to a paid gig. We’ve just kept working, getting work from friends, and trying to give work to friends. I like external pressures–deadlines create a sense of momentum–but internal harmony. We like working with small teams of close friends, in a setting where everyone feels like they can offer ideas to improve the project. For me, the best work always comes from a personal place. Louis CK is a big inspiration for me. Not only is he one of the greatest stand-up comedians, I think he’s also one of the best filmmakers alive. I admire both his insane work ethic and his willingness to say no until he has a reason to say yes to a project. I think the fact that he is able to so many hats on his projects (writing, producing, directing, acting, editing) lends them the kind of personality and sense of voice you don’t see much on TV. Adam & Eve started as a ten-minute play I wrote when Bianca and I first started hanging out. Bianca was helping run a theater at the time, producing original ten-minute play festivals, and I wrote the script for one of them. It was produced several times and published as a play. Flash forward a few years–we’re married and graduated from school and we were in the market for a film project we could make with just a few friends, locations we had easy access to, and limited equipment. We thought of Adam & Eve, and I decided to see how it would work adapted into a short film. After adapting that first script, suddenly it felt like this was just the beginning of a much longer story. So I kept writing, and came up with a lot more–six half-hour seasons in all. We hope we’re able to do them all. It took awhile, but we finally were able to round up our cast and crew and head up into the mountains to shoot last spring. 6. The driving heart of the series is the relationship between the characters. What inspired this unique take on this ancient story? It just occurred to me one day that the Adam & Eve story, in addition to all the other functions that story serves, could be a pretty funny setup for a romantic comedy–he’s the only guy in the world and maybe she’s just not that into him. As soon as I had the idea, I stopped what I was doing, sat down, and started writing it, and that ten-minute play was initially birthed all in one day, from initial conception to near-final draft. But this take on the story definitely has some parallels with our own relationship. The first three episodes come primarily from that ten-minute play, which was written when we first started dating, and they’re very much about courtship, while the others were written a few years into marriage and are all about that transition and what marriage and commitment mean. 07. Share With Us, Your Involvement With The Grassroots Shakespeare Company? Bianca and I were both founding members of The Grassroots Shakespeare Company. Grassroots is an original practice company, which means we try to do Shakespeare the way Shakespeare was done back in Shakespeare’s day–which is very different from theater today. Elizabethan audiences were wild and rowdy and even dangerous, and there was much more interaction with the crowd. The plays were put on with minimal rehearsal and no director or designers, just a company of actors working together to try to entertain a crowd–more like a rock band in many ways than what we think of as theater. Bianca and I have both acted with and produced for Grassroots since 2009. It’s a uniquely collaborative DIY process that has also very much informed our approach towards our other independent film and theater projects. 08. What Is Your Favorite Variety Of Apple? Davey & Bianca Morrison Dillard are a modern married producer-director duo making their way through the lone and dreary world/handmade paradise of DIY filmmaking and self-distribution. Davey Morrison Dillard is an actor working in film, TV, commercials, and voice over, as well as a screenwriter, director, and editor. Additional credits include THE NOSE (Center for Puppetry Arts, writer-director-actor), EUGENIE (BYUtv, writer-actor), BEN & THE ART OF REGRET (Academy Nicholl Fellowship semifinalist, writer), WWJD (producer-director), and WELCOME TO THE RUBBER ROOM (actor). In addition to his work in film, Davey is the Director of Education for The Grassroots Shakespeare Company. Bianca Morrison Dillard is an actor, dramaturg, producer, and director in film and theater. Additional credits include FAR BETWEEN (producer), FRESH TAKE (BYUtv, producer), WWJD (producer-director), and HOLIDAY (dramaturg). Bianca serves on the Board of Directors for The Grassroots Shakespeare Company and is former Artistic Director of New Play Project. PODCAST 004: "Filmmaker Daryn Tufts"